Corfu, known as Kerkyra in Greek, is situated off the north-west coast of Greece in the Ionian Sea. It is the northernmost and most popular of the Ionian Islands. The island has excellent beaches and clear water making it a popular holiday destination. Blanketed with Olive trees, it is one of the greenest of Greek Islands. Corfu is roughly shaped like an elongated triangle, with the widest part in the north and tapering down to the southern most tip. It is mountainous, with the highest point Mount Pantokraton (over 1000 meters) in the north. The weather of Corfu is quite unique amongst Greek islands and it ensures that Corfu is the lushest and greenest of the islands. The island enjoys a Mediterranean climate, with warm dry summers and mild winters when most rainfall occurs. 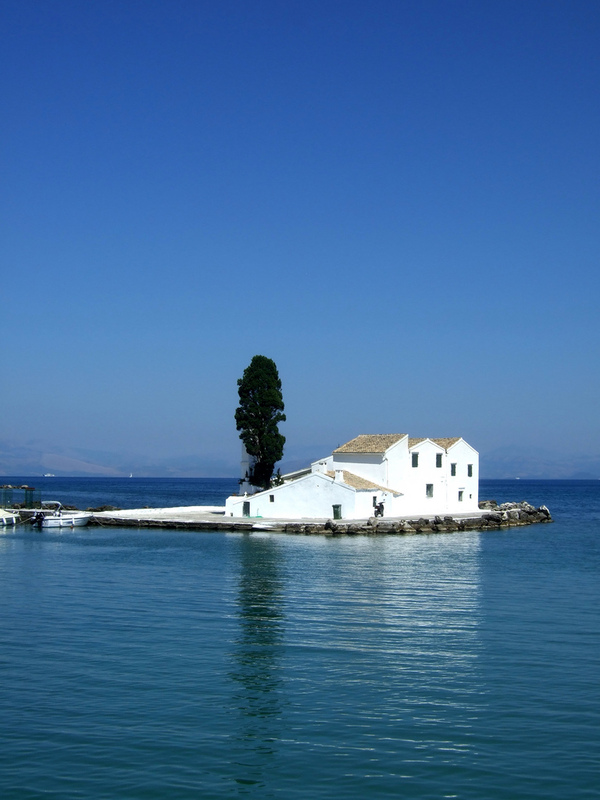 Corfu averages over 3000 hours of sunshine a year with a daily average of 8.5 hours. Corfu’s location, east of Italy and south-west of Albania places it at the crossroads of sea routes from The Adriatic Sea to southern Greece and the Mediterranean sea to the Adriatic. This has resulted in a long and varied history with the island being controlled at various times by the Greeks, Romans, Venetians, French and British. All have left their mark. Having been a popular tourist destination since Victorian times, Corfu has a huge selection of accommodation options to suit all tastes and budgets. There is a large selection of hotels in Corfu, with the largest choice being found in Corfu Town. Peak season can be busy and as such is it best to book your accommodation prior to your arrival. It can often be confusing and frustrating trying to find Bed & Breakfast accommodation on Corfu as often what is billed as B&B actually turns out to be self-catering apartments. However, B&B accommodation is available; you just have to search for it! Most B&B accommodation is actually provided by small hotels rather than family homes. There is a plethora of apartments, villas and rooms to rent available on Corfu. Ranging from simple studio accommodation to the grandest of luxury villas with private swimming pools and everything in between. There are many firms and tour operators offering this type of accommodation, though it is often possible to source the accommodation directly from the owner. As with hotel accommodation, peak season can be busy and as such it is better to book in advance. Surprisingly, Corfu has campsite accommodation available. This is possibly the cheapest accommodation available on the island, with prices ranging from less than €10 per person per night. Don't have a tent? No problem as the price will often include the loan of the tent. Caravans and motorhomes can also be accommodated.